The world’s first geothermal-solar power plant was dedicated in Fallon, Nevada at the beginning of the month. “The Stillwater geothermal project, which received $40 million in tax support under the Recovery Act, has harnessed innovative technologies to add solar energy to the facility and provide 59 megawatts (MW) of combined capacity to power more than 50,000 local homes,” the Department of Energy (DOE) notes. The Stillwater plant is advancing local economic growth, diversifying the nation’s energy mix and reducing pollution. The project was supported under the 1603 tax program for renewable energy that provided American companies with tax support up front to spur the deployment of clean, renewable energy resources, like geothermal and solar. A recent study by the National Renewable Energy Laboratory that examined the economic benefit of the program, estimated that it has created up to 75,000 jobs nationwide in design, construction and manufacturing and $44 billion in total economic output. Currently, utilities often use renewable energy sources like solar power during hours of peak consumer demand, and combine it with a “baseload” coal or natural gas plant to ensure a steady power supply. The Stillwater facility combines 26 MW of photovoltaic solar generating capacity with 33 MW of baseload geothermal power, demonstrating how a single power plant can deliver renewable peak and baseload power to American homes, businesses, and whole communities. 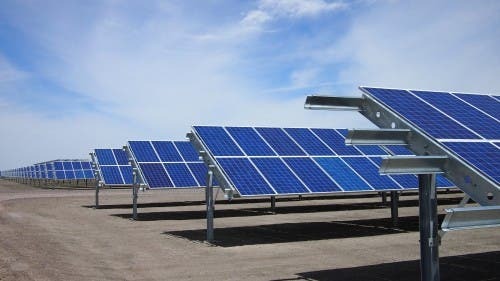 To provide the solar energy, Enel Green Power North America (EGP) installed more than 89,000 polycrystalline photovoltaic panels on a 240-acre parcel of land adjacent to the Stillwater geothermal plant, which opened in 2009. Early investment by the Energy Department accelerated geothermal development at sites across Nevada and Utah, including those in the Stillwater area. Of the fourteen areas, including Stillwater, studied under the Energy Department’s research program, seven currently produce electrical power. The research also helped utilities better judge the viability of specific geothermal systems as reliable energy sources and gave the financial sector reliable information for investing in these developing projects.